← “New” Beach : A Lot To Love. And The Back Story On Ball-Playing. This entry was posted in Local business, People and tagged AJ Izzo, Crossroads Ace Hardware, Janet Lane Horelick, Jimmy Izzo. Bookmark the permalink. Good luck AJ (RED) Izzo. Knew you when you had hair! Will miss the store. I have a question. There are two people there with the last name of Izzo. How are they related to Butch Izzo, if they are related to Butch Izzo. I’m just curious. Butch Izzo and Red Izzo are brothers. They were a family of thirteen children. The family lived on Richmondville Avenue. Some of them still live there. Thanks for the clarification. My guess is Butch is maybe 75 years old now. I’m going to miss these folks and the store! These people were always helpful and always so pleasant. THANK YOU for years of assistance and bright smiles! They will be missed. Always a pleasant place to shop. Always a friendly hello! I hope you know how you will be missed! I made the “trek” from Norwalk to buy EVERYTHING from Crossroads. Actually, I was in there in April where they helped me find a suitable screening to keep the birds from nesting under my deck. And I told them “that’s why I love this place, you always find the perfect solution.” So sad that it is closin! When Crossroads first opened, I purchased two blue beach chairs from them, which cost a bit more than what was out at the discount stores… and I’m STILL using them, almost 30 years later! Enjoy your time away from retail, you’ve earned a well-deserved rest! Love you Jimmy, AJ and Janet! I will always remember Crossroads Hardware because they carried half-pint cans of orange enamel when no other stores did. I needed the orange color to mix into some other colors for a unique shade. Remember great advice about a woodpecker drilling holes in my front porch. We’ll miss you guys. Go well and good luck. The Lefkowitz family will miss you all- Thank you for being true community helpers not just a retail business. Crossroads Hardware was the Best . Our Town lost another locally owned Mom & Pop store due to the Big Box stores and the internet . What are people going to do now when they need advice , or help with fixing a item ? 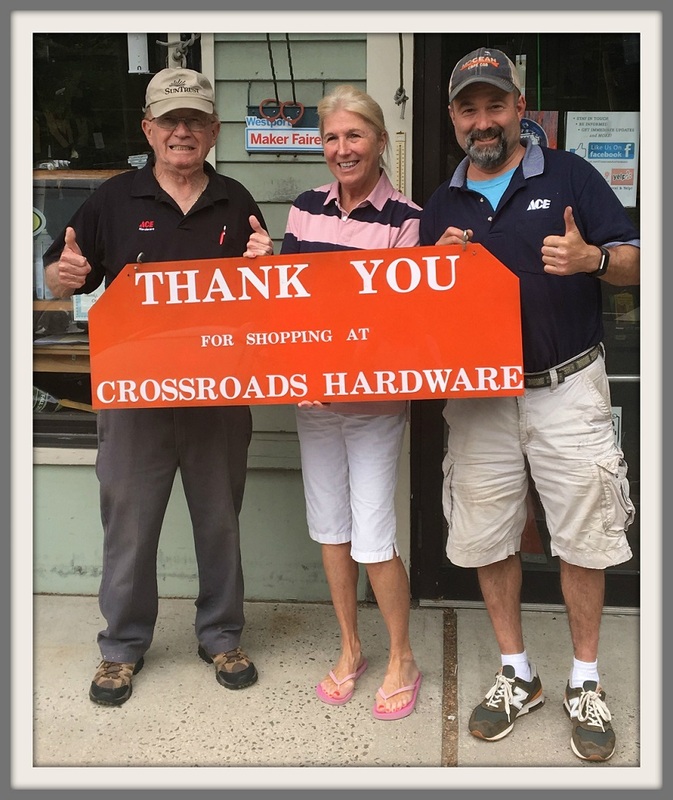 Crossroads Hardware always provided Top Class service , and had a list of people who could provide your service needs if needed .. I’ve been shopping there sense they opened the door .. Its been a Pleasure doing business with you Jimmy & A.J ..
Jimmy, Red, Janet – greetings from SF. Congratulations on a great run and thanks for your service to the Westport community! Thank you guys. You came to our rescue many times. Y’all made Westport what it was. 27 years ago, Jimmy opened Crossroads Hardware right around the corner from my house. For 27 years they’ve been my first stop whenever I needed a tool, paint, advice, or just a laugh. When they didn’t have something I needed, they would immediately order it for me or send me off to one of their competitors (they always seemed to know who had what). I found my electrician and my plumber through them. AJ helped me design my kitchen. Joe helped me restore an antique motorcycle. I’m now the proud owner of the sign shown in the picture – it hangs in a place of honor in my garage, just in front of the boxes where I keep the hardware I’ve purchased form Crossroads over the years. I’ll miss you guys and I hope (and expect) that you will find success in whatever comes next. Hear Hear for a great run, to an exceptional team! Will miss you guys…best hardware store with small town feeling. So sad to see you go!!! I bought my very first beach chair there when I came to town in 1986! Haha. And anytime I was in, it was nothing but a great experience!! Best of everything to all, and you will be missed! !